This replaces the factory's amplified 10 speaker system (1 in each front kick panel, 2 in each door and a woofer and tweeter for each side in the back). The sound from the 7 new speakers leaves no comparison to the factory components. It's like night and day. Speakers are all installed in factoory locations. Front mids in kick-panels, front tweets in the door's mid location (left factory tweets in door but unused), rear coaxials inside factory speaker baskets and left rear tweets in there as well but unused. 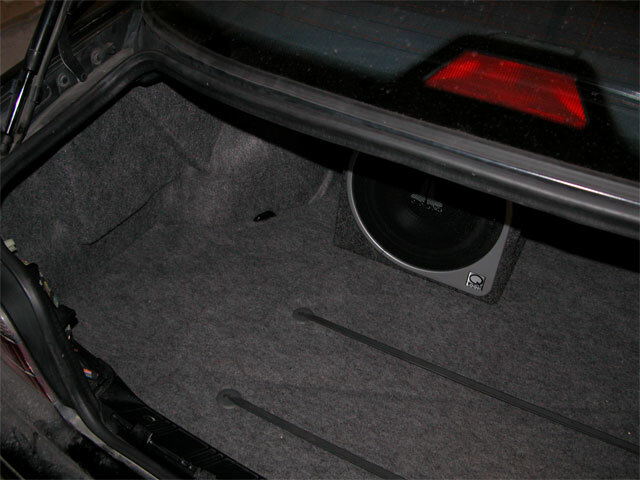 Sub mounted in the trunk under amp. Here's an image of the empeg sitting in the single DIN slot in the dash. The stock BMW radio/cassette had to go. The empeg is the only source of music in the car. Still need to put a red lens in - and perhapps clean this one in the meantime. 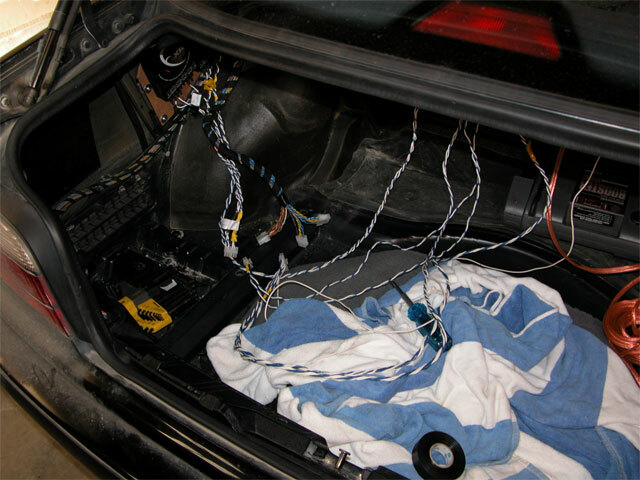 Here you can see a shot of the trunk and the custom connectors I fitted to the factory wiring. I cut the factory wiring near the pre-installed factory amp (not shown). Divided up the wires that went to the original two connectors into three groups and attached mating Molex Mini-Fit Jr. connectors on both cut ends. This allows me to connect the factory amp any time I need to restore the car to its original condition. You can also see other mating connectors that are on the ends of custom wiring that goes to the new amp. This wiring accounts for both line-level conductors from the deck up front, remote-on and of course wiring running to the speakers. Up front I used an aftermarket BMW wiring harness to connect the factory connector to the empeg. 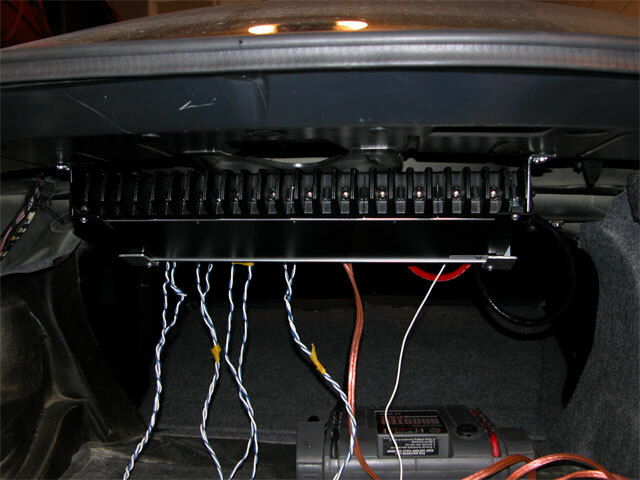 I modified this harness by soldering RCA plugs to the wires normally designated as speaker leads (did the same to the custom connector in the trunk mentioned above). This way I could re-use the factory wiring instead of running new cabling. I didn't need to run any cable at all from the front to the back of the car. 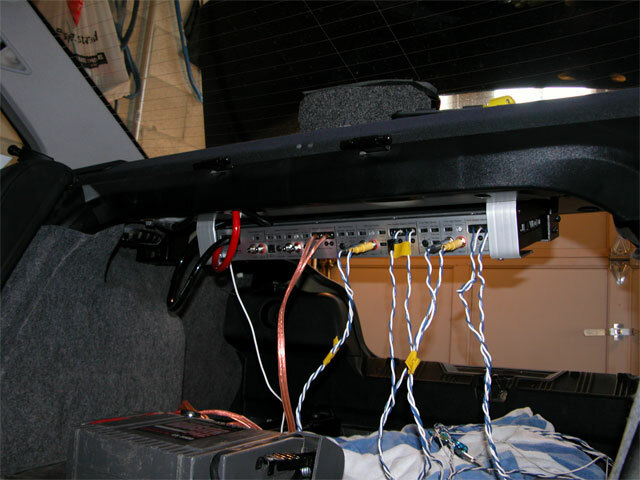 BMW installs unshielded twisted pair for all the wiring connections and this is the perfect base for an aftermarket install. In the top left corner you can also see a tiny bit of the cross-overs for the front component speakers. Looks like a mess, doesn't it? Here's a shot where you can see the custom wiring running to the amp. 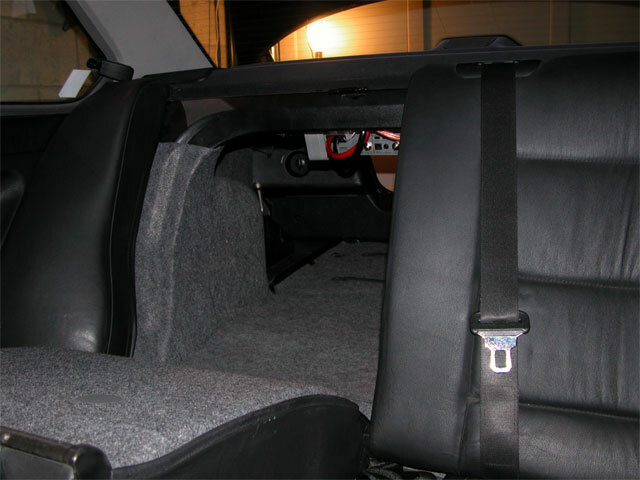 You can also see that the amp is mounted to the rear deck (under the parcel shelf) with some custom brackets (that I made with aluminum flats and angles). This is a close-up of one of the brackets holding the amp to the car. 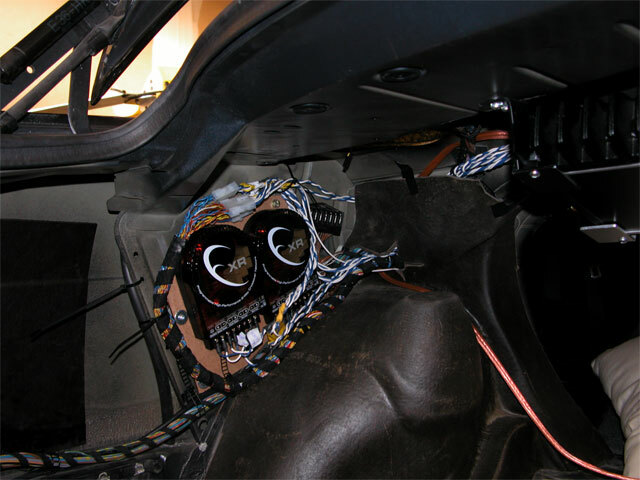 Here's a shot from the inside of the car showing the back of the amp where all the controls are located. You can more clearly see the rear aluminum brackets and the (as yet) dangling untrimmed and untucked wiring. 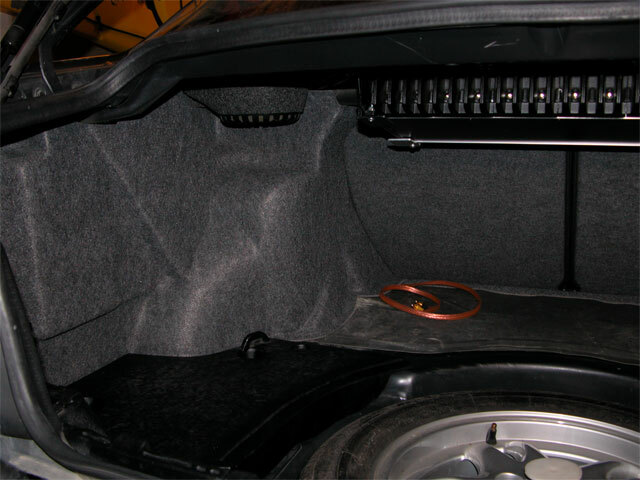 You can also see one of the speaker baskets sitting on top of the parcel shelf waiting to be re-installed. After connecting the molex ends and putting back the original wire-ties, routed the harness and new wiring over top of the cross-overs. 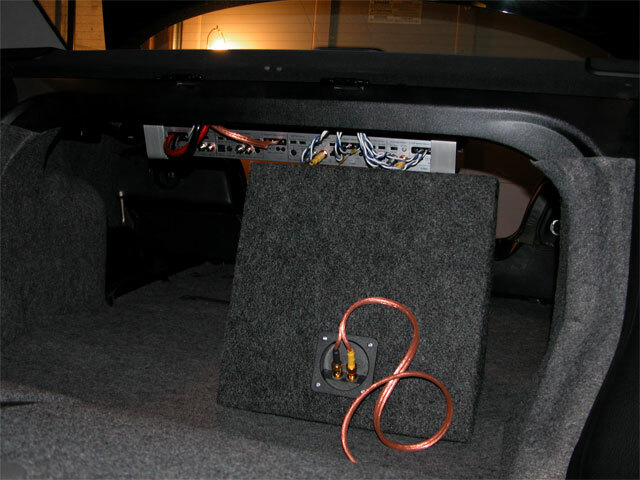 The cross-overs are mounted to a 1/8" thick piece of MDF (masonite (brand name) fibreboard) that is mounted to the factory amp location on the left side of the car near the shock tower and wheel well. The left-side speaker basket is missing in this picture and you can just see its connector hanging to the right of the cross-overs near the opening that goes into the cabin. The copper-coloured cable is for the sub and is routed along a crevice so it won't cause interfence/bulging when the cover/carpet is put back. After putting the trunk liner back on the left side things start to look a lot cleaner. You can now see the speaker basket sitting installed. I wrapped it in some carpet to help keep it closed (I had to break the glue seal that was originally holding it together). And there's the trimmed down cable for the sub terminated with banana plugs. This is another shot from the inside after everything has been put in place. Passnger seat folded down. And now both seats folded down. The cables have been routed within a support structure and the power and ground cables have been trimmed. The ground cable is attached to the support member of the car with about 22" of wire. The bolting point was ground clean of any paint with a rotary tool & sanding attachment. Ground wire is 4ga just like the power wire (never ground with smaller gauge than used for power). This last picture shows the empeg sled without the unit itself. It's mounted fairly securely, but unfortunately with the BMW dash, only the side tabs offer any meaningful holding capacity. I trimmed down the bulk of the empeg wiring loom by removing a bunch of items I knew I wouldn't be using in this install: serial cable, tuner connection, aux input connectors and mic connector. Everything able to be put back together if I ever need to of course. That's it for now. Still need to adjust the sensitivity for the three sets of outputs on the amp. Everything sounds fantastic with just the minimal coarse adjustments at install time. Is there something special about the plastic and leather in a BMW interior that makes it appear BLACKER than that of other cars when flash-photographed? I mean that stuff looks reallly really black, when the black interiors of other cars doesn't seem quite as black. The black isn't too shiny, plus it has a decent texture. I'm sure it has a lot more to do with variable flash power on the camera however - and the fact that I was a fair distance back when taking the shots. I believe I had the power set down 1.7 stops (Nikon E5700). I mentioned in another thread that I wished I had had the patience to really document everything, because there just aren't enough BMW audio resources that give detailed images or facts. Case in point is the incorrect wiring diagram I mentioned. Plus a lot of installers run new wires and then complain about noise (duh). Or put new tweeters where the factory ones were and complain about poor imaging (tweeters should be near the mid-woofers and as far from your ears as possible). Putting mine in the door's mid position was a compromise so that I wouldn't have to come up with custom kick panels. Though I did have to fabricate my own little tweeter holder and hot-glue it into the mid pod in the doors. Should have gotten some images of that. A lot of people also don't know you can open the rear speaker baskets up. I believe it's one of the reasons you'll find that people claim the 3-series fits 4" speakers in the back. Sure, if you bolt the speakers in place directly to the car. If you use the stock baskets (removing the stock speakers), then you can easily fit 5.25" mids or coaxials in the back - without any custom adaptors or fabrication. I also wanted to document what connectors are present on the factory speakers. The back (whole baske), door tweeters and mids use small 4-pin connectors similar to computer internal audio connectors. The front mid-woofers use standard press-fit connectors (can't remember actual name, some people call them spades, but they're not). So to install aftermarket speakers one may need to replace these press-fits, but the door tweets and mids should be wire-tapped (no need to cut the wires by using a standard wiretap that attaches parallel to the existing wiring). 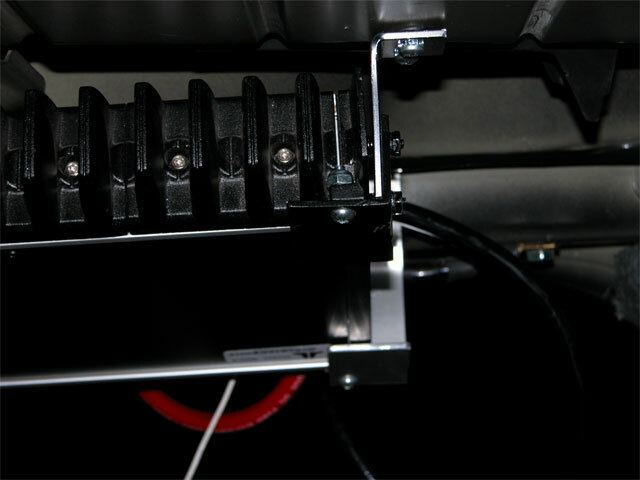 If using the rear baskets, again, standard press-fit connectors are used and they'll plug right into a lot of aftermarket speakers - then you simply re-connect the custom factory connector to its mating plug. I could have likely done the install without drilling any holes as well, but it would have taken more time and likely not have been as stealth. It would also have required a 4' ground cable and I didn't want to go over 3' (ended up using less than 2' in fact). I had fun. A lot more fun that connecting up the system in my Integra in 2001. A lot less work too. And I can say with certainty that the imaging is far superior. Can't comment on the SPL until I get the sensitivity adjusted. I had two 8" subs in a small ported enclosure in that system versus the single (and much higher end) 10" in a sealed box now. Next I'll likely help my brother with some of his install. Same amp in a 2002 Acura TL. Except he has 6" speakers front and back, both sets of the XR series, and two of the same 10w6 woofers in a sealed box. That's going to be LOUD. Nice install Bruno. I'm (hopefully) about to buy an 1998 E36 M3 (subject to a dealer inspection tomorrow). You mention a few times using the factory speaker wiring from the head unit to the amp instead of new cabling which others used and had noise problems. Did you have any noise issues? AFAIK, the normal BMW headunit outputs a balanced signal which means you can use twisted pair wiring no problem. However the empeg is single-ended. So reusing the wiring is technically the wrong thing to do particularly when the amp at the other end is single ended as well - yours isn't it seems so your lucky. As you are using a differential input amp like the factory one you'd probably get away with it. I've seen at least one other E36 install done like this (empeg too link here), but he used the factory amp. I don't really want to do such an extensive install on my future car, but I'm going to need MP3s somewhere or somehow. I was hoping for perhaps empeg only and leaving the existing amp and speakers. I know BMW is not renowned for the stereo systems though so I might just do the head unit first. I want to keep mine fairly reversable too in case I sell the car. Thanks for the info - there really isn't that much out there that I have seen. Actually, Bruno was being modest. The black used on BMW vehicles (but especially on the 540I Sport, pre 95 models) is, truth be told, a very special German black. Deeper and richer, like their chocolate cake. Very dangerous if not used wisely. The install is crystal clear. In my last install, in my former Integra, also using JL Audio amps, I made my own line-level wiring using CAT-5e ethernet cable. It worked very well and cost only the price of the RCA plugs. A number of better car audio cables are now UTP. Most of them aren't cheap. Previously, in other experiments I have installed (and removed) Scosche, Rockford Fosgate and a few other misc. wiring brands. They all claimed some special/unique shielding and single-ended grounding to "drain" the noise, etc. They were all noise antennas. Crap. The BMW factory amp (and head unit) are connected using the car's UTP, however the signals are speaker-level, not line-level. I could have used the JL amp with the rest of the stock configuration as it supports higher voltage input too. But the point was to get the empeg in there. 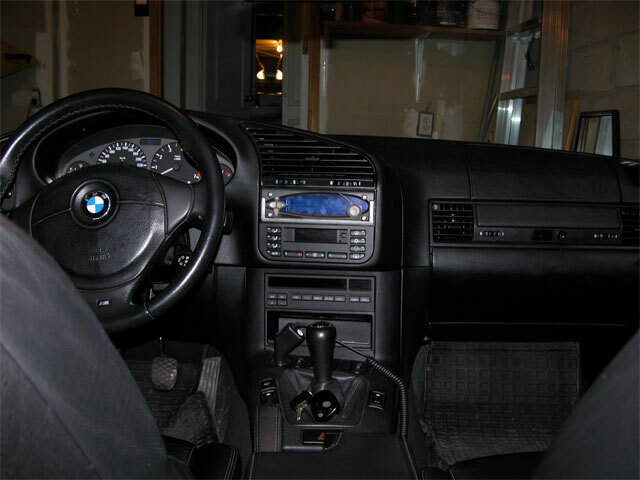 The BMW stock stereo system is only poor when compared to a decent aftermarket setup (IMO). All things considered, it's a lot better than most stock systems I've heard. The system can be upgraded and improved in a number of ways without swapping out the whole thing (according to posts by quite a number of people, including one of the original designers of the system). One caveat I forgot to mention is that even though the battery is in the trunk, making running an amp power wire relatively easy, the stock power wire for the car is either 0 or 1 gauge (meaning you'll need a big aftermarket positive terminal) and it's also VERY short. After cutting off the factory terminal and trimming off some of the solder at the end of the wire, it was just barely long enough to reach into its socket in my aftermarket terminal. Another 1/4" shorter and I would have been screwed. I also didn't have an aftermarket terminal that could accept anything larger than 4ga, so I had to drill it out to accept the larger BMW stock wire. That wasn't fun. Can you point me towards these posts please? I've had a pretty good look around and haven't found much similar to what you describe. I'd probably be most interested in a head unit replacement only initially ala elvis's install I linked to earlier. I've just heard in general that 3-series and I think specifically E36s can be very difficult to get a noise free install. However as you say, it's not at all impossible. 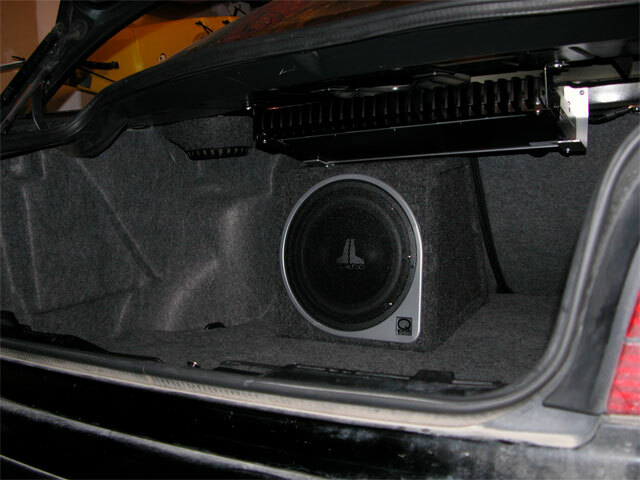 What you are doing seems to defy conventional logic when it comes to car audio. If it works though then fantastic and I'm sure it saved a lot of headaches running cables front to back. Conventional car audio logic is wrong (I wish I could say "but infrequently"). You only need to read some of the forums for a few minutes to see that. I used to follow a pretty good forum for a little while, but even that place found the no-BS people outnumbered by the know-it-all-lemmings. 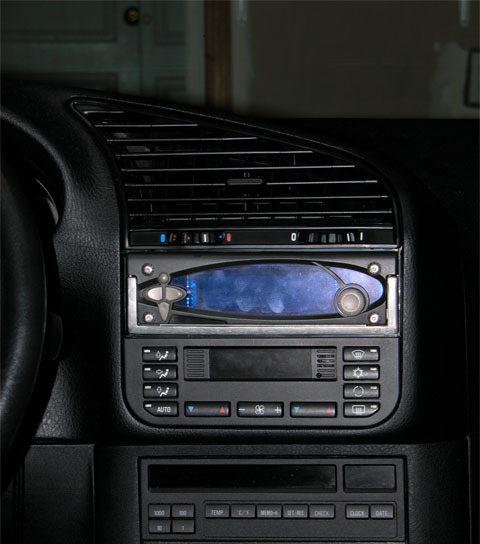 I've also only found one (really) good general car audio site. Can't remember the URL right now, but I know Tony has it in the FAQ. Note: pin #13 on head unit connector is Illumination and the wire colours for tweeter and mid for the LEFT FRONT are swapped (with each other). And from another doc, the door panels require a Torx 15 driver, not 20. The instructions on Chester's page (last link) for removing rear speakers grills is also incorrect. Just don't take any of the installation instructions and wiring details as hard facts. Make sure you verify against your actual car and be careful when working. BTW, the stock head unit uses a pentagram key, not a hex key, for its retaining screws. You can (carefully) use a smaller hex wrench to loosen them though. The head unit slides right out afterwards. Hey guys, if you want to look at my custom install I had in my '97 BMW M3, go to www.BIMMERFORUMS.COM and do a search. You should be able to find pics of my install. It's a white 4 door M3, my nick on the forum is Firefighter. I sold the car earlier this year. Oh, I didn't realize you had to be a member to view the pics. I know you didn't have to before. It's mounted fairly securely, but unfortunately with the BMW dash, only the side tabs offer any meaningful holding capacity. Bruno, did you have to hack the dash at all to hold the sled? Or does it just slot straight in? It will slip right in, you just have to push the tabs in as far as you can and as many as you can. It will hold tight. Mine did anyway. Yup, the BMW dash is single DiN, so it fits like a glove. It's not going to come out all by itself or by sliding the empeg in and out, but it would be easy to rip out just by grabbing it from the inside with your hand. About the only thing that would improve the look of the installed unit would be if the empeg's fascia were thicker - or if the sled weren't inserted al the way (but then the tabs can't be made to lock as securely). That would make the front of the empeg sit more flush with the rest of the console. Where did you get/what did you use for a harness adapter? Just one of these? Guess I should get to and order one if I'm going to at least try this. Yup, exactly one of those. Though I only paid $7 shipped. But of course the plastic housing on mine sucked and allowed the pins to push back through when plugging it in. Useless. Had to install without the housing (but it's secure). So go ahead and pay the extra at Crutchfield (or another store) but make sure you're getting a well built harness. You can also find Scosche ones on ebay which should be OK. Most BMWs use the same harness (during the 90's). Make sure you don't accidentally get anything that's designed for an e46 - those are definitely different. I think some type of changer control would have a lot more application merit than an OBD2 interface. I'm sure a lot of people would be interested in it - I might be too. Generated in 0.033 seconds in which 0.018 seconds were spent on a total of 21 queries. Zlib compression enabled.